Published associations between dietary folate and bladder cancer risk are inconsistent. Biomarkers may provide more accurate measures of nutrient status. 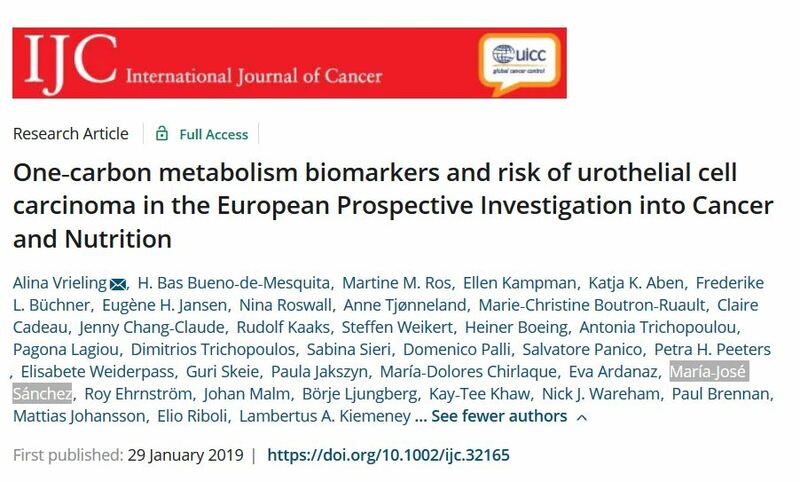 This nested case‐control analysis within the European Prospective Investigation into Cancer and Nutrition (EPIC) investigated associations between pre‐diagnostic serum folate, homocysteine, vitamins B6 and B12 and the risk of urothelial cell carcinomas of the bladder (UCC). A total of 824 patients with newly diagnosed UCC were matched with 824 cohort members. Serum folate, homocysteine, and vitamins B6 and B12 were measured. Odds ratios (OR) and 95% confidence intervals (CI) for total, aggressive, and non‐aggressive UCC were estimated using conditional logistic regression with adjustment for smoking status, smoking duration and intensity, and other potential confounders. Additionally, statistical interaction with smoking status was assessed. A halving in serum folate concentrations was moderately associated with risk of UCC (OR: 1.18; 95% CI: 0.98‐1.43), in particular aggressive UCC (OR: 1.34; 95% CI: 1.02‐1.75; P‐heterogeneity=0.19). Compared to never smokers in the highest quartile of folate concentrations, this association seemed only apparent among current smokers in the lowest quartile of folate concentrations (OR: 6.26; 95% CI: 3.62‐10.81, P‐interaction=0.07). Dietary folate was not associated with aggressive UCC (OR: 1.26; 95% CI: 0.81‐1.95; P‐heterogeneity=0.14). No association was observed between serum homocysteine, vitamins B6 and B12 and risk of UCC. This study suggests that lower serum folate concentrations are associated with increased UCC risk, in particular aggressive UCC. Residual confounding by smoking cannot be ruled out and these findings require confirmation in future studies with multiple measurements.